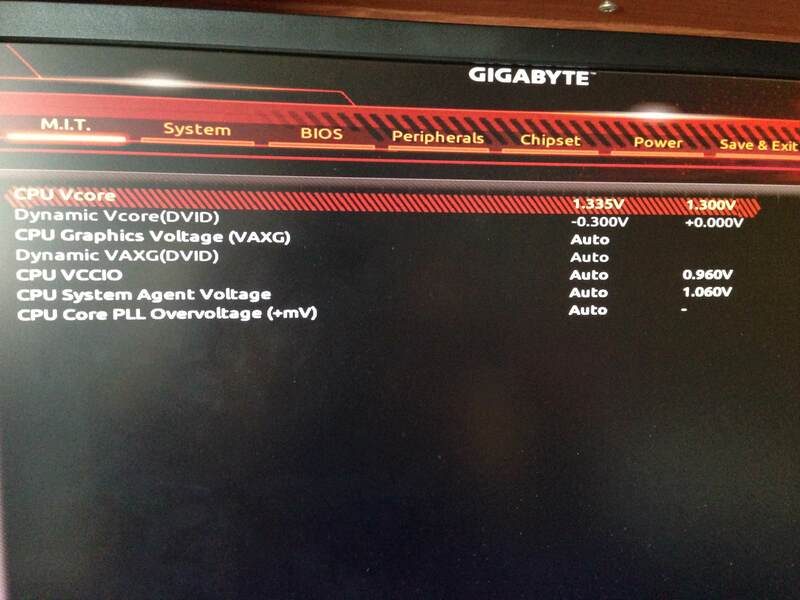 Gigabyte z170-HD3 F21, how do I set DVID? does it work? but when I change the voltage settings to normal it unlocks DVID i add +0.050v change it back auto max voltage hits 1.332v, but it crashes when I play pubg? it doesn't crash when it's on manual. I try adding the voltage manual with 1.335v trying to figure out how to unlock DVID which I did i put -0.300v expect it to drop voltage when idle. but it doesn't? The only settings that drop voltages are AUTO and Normal (which i think the same ) it has a cap of 1.300V, DVID works +. Anyone know if DVID works on manual or is that not a function on this mobo, im still new to this. I am pretty sure that dvid adjustments only actually work when set to normal mode. Auto will go full auto no matter what. Manual settings will always be at a fixed voltage of whatever you have vcore fixed at. when set to normal dvid will add or subtract the set amount of voltage from whatever the cpu expects to get at the frequency its at. Most 6600k cpu's will have a stock voltage somewhere around 1.2v to 1.25 volts. The dvid offset will be added to or subtracted from that. On my z170 gaming 7 with a 6600k at 4.6ghz I have it set to normal with a dvid of +.115. with LLC set to high this gives me a under load voltage around 1.38v actually measured on the board with my meter. cpu-z reports it fluctuating between 1.36 and 1.38, hwinfo show voltages around 1.2v all the time. Also dont forget to set your uncore frequency to the same multiplier as your core. You can also set it to one less than your core if its not stable, or slightly increase your core voltage to get it stable. the uncore voltage and core voltage are set at a fixed ratio on skylake. I actually revert back to 4.5ghz with the setting set to Normal but it says 1.300v on the right side? is that the stock voltage where I can add + DVID to achieve 1.344v, currently (DVID + 0.070) i have LLC high on but I haven't touch the uncore frequency. HWmonitor says max is voltage is 1.344v. Though I don't think my 4.6ghz is stabled it needs 1.395 voltage, hasn't crash on manual but when it set on normal. and added DVID + it fluctuating while in game 1.36 - 1.392 idk if the voltage fluctuation may cause my game to crash or it doesn't have enough voltage.